Utility poles offer the necessary power and connectivity that is vital for small cell deployment. Providers will likely continue to increase permitting requests for small cell attachments, and pole owners may struggle to handle the number of incoming applications. Knowing what to expect from small cell attachment requests would greatly help owners expedite the approval process. Understanding how small cell differs from more traditional attachments may help owners revise attachment permitting procedures, as well as streamline communication efforts between the two parties. The three types of small cells are typically defined by their range of coverage. Femtocells: The shortest range of small-cell types, femtocells cover 10 meters or less. The router-like devices are usually deployed in homes or small businesses; they accommodate coverage for a few users at a time. Picocells: Usually installed in large, indoor areas (like shopping malls, offices or train stations), picocells can support up to 100 users at a time. Microcells: The largest and most powerful small cell, microcells are usually installed by network operators on traffic lights or signs. They have a range of under two kilometers, and are used to deliver larger capacity for big events. Small cell equipment is positioned on the pole, interconnected, and grounded—all according to pole owner requirements, NESC guidelines, or State requirements. 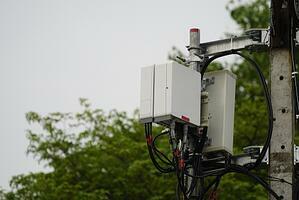 In addition, good design and engineering is crucial to successful small cell deployment. Small cells are low-power devices that range from 100W to 500W, depending on the strength of the RF signal. Even when two or more devices are mounted at the same site, the total power consumption is supplied by a 20 Amp circuit from the electrical utility. Access to power is a requirement for small cells to function. If power is not available, the network provider will have limited choices on where to deploy. These situations create logistical and expense problems that could jeopardize the project. Some carriers also need back-up power sources, such as small solar-power solutions or a centralized Direct Current (DC) power hub. Small cells use backhaul solutions to transport data from the field to the operator’s network. Backhaul infrastructure can include dark fiber, lit circuits, cable TV, or a wireless solution. Typically, a small cell attachment is mounted on the top of a utility pole. If that spot is already taken by a service provider, new providers must find another pole or location to attach. As with other joint use attachments, engineers must assess structural integrity before approving a small cell attachment. Considerations include safe weight loading capacity, how much added wind-force the antenna will contribute, and the weight-loading impact of internal or external cabling. 5G's architecture will be much different from 3G and 4G wireless infrastructure. Instead of widely-spaced large cell towers, 5G relies on smaller and denser configurations of small cell antennas. Currently, asset owners are navigating the small cell attachment process project-by-project. Improving communication and process between owners and attachers would help to streamline small cell attachment permitting. As joint use asset owners and government bodies are becoming overloaded with attachment permitting requests in general, they are looking for new solutions to remedy their joint use challenges. Today, there are many options to navigating the changing joint use landscape. Carriers can select the best joint use options, using less expensive, automated tools. Platform-based software is simplifying deployment hassles by eliminating unnecessary paperwork and repetitive data entry. Joint use departments are currently in great need of better communication tools, where owners, attaching companies, contractors, and field workers can communicate about one pole or many poles in the same platform.